In Heaven and Hell class today Rev. Andy Dibb pointed out that there are a couple of buildings that have some similarities to the Temple of Wisdom that Swedenborg describes in True Christian Religion 508:1-2 and True Christian Religion 387:2. 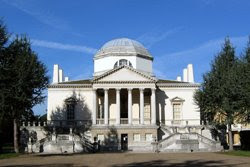 The two best examples that I could find were Chiswick House and La Rotonda. Do these pictures look to you like these two descriptions?